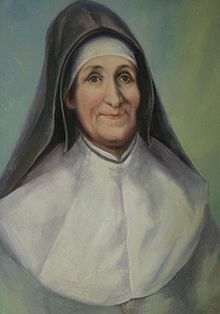 St Julie Billiart was born the sixth of seven children in Cuvilly, Picardy, France. She was a bright child and delighted in sharing her catechism and bible stories with others. At the age of 9yrs, and instead of the usual 13yrs, she was allowed to receive her First Holy Communion. At 14yrs, she took a vow of chastity and, greatly respected by her community, they named her “the Saint of Cuvilly”. At 22yrs, St Julie suffered severe paralysis of her body and for approximately, twenty-two of the following thirty years, she was confined to bed. St Julie quietly accepted her pain and burden, offering it to God as penance. She spent much of her confinement period in prayer and helping others to pray. One day, after reciting a Novena, St Julie was miraculously cured of her paralysis and accepted a request to devote her remaining life to the care of young girls. With the help of a rich Viscountess and the Bishop of Amiens, she founded the Sisters of Notre Dame. St Julie was appointed its first Superior General. The Order opened numerous convents and schools and continues to thrive throughout the world today. St Julie Billiart’s Feast Day is 8th April, the day of her death. She is a Patron Saint of poverty. Pray for us that we will have the strength to never give in to whatever hurdles befall our path.